Now, you may be wondering, how many carbs in pineapple are there, and what are the health benefits of pineapple? Read on to find the answer to these questions and more. If you’re trying to build healthy habits and improve your overall wellbeing, you may be concerned about your intake of carbohydrates. In fact, carbohydrates are one of the essential macronutrients that we need to include in our diets. Still, you want to make sure you are eating the right kinds of carbohydrates and the right amounts. 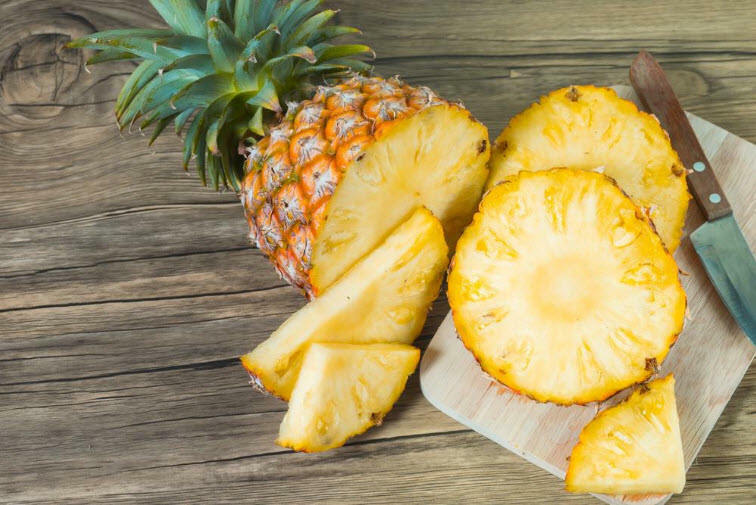 Fruits such as pineapple are an excellent dietary source of simple carbohydrates that give us the energy we need to fuel our bodies and our minds. Pineapple is a delicious tropical fruit that is popular around the world. You can eat it canned, dried, sugar coated, or fresh. Originally from South America, this tasty treat is now grown in tropical climates around the world. Naturally sweet, this fruit is also a powerhouse of nutrition. A one cup serving of pineapple will give you 1 gram of protein, 0 grams of fat, and 22 grams of carbohydrates. Of those carbohydrates, 2 grams are insoluble fiber, and 16 grams are sugars. Additionally, 1 cup of pineapple provides your body with vitamin C, manganese, copper, folate (vitamin B9), thiamin (vitamin B1), and vitamin B6. With all of these macronutrients, vitamins, and minerals, it makes sense that pineapple would have many different benefits for your health. From your eyes to your internal organs, including pineapple in your diet can benefit your body in so many ways. Pineapple contains a compound known as bromelain that scientists around the world have been studying for years. Bromelain is a mixture of substances and enzymes which has a whole wealth of health benefits in the body. Found in the leaves and core of pineapples, it is best taken as an extract. Bromelain has been clinically shown to reduce excessive inflammation, blood coagulation, and some tumor growth within the body. The reduction of these illnesses will result in increased wellbeing and longevity. Pineapple is an excellent source of vitamin C, the primary water soluble antioxidant in our bodies. Antioxidants like vitamin C attach to free radicals in the body and remove them. Free radicals are compounds that attack cells. An abundance of free radicals can lead to joint pain, osteoporosis, rheumatoid arthritis, diabetic heart disease, arterial plaque build-up, and can lead to asthma attacks. By consuming pineapple, we give our bodies the vitamin C it needs to fight off these illnesses. Additionally, vitamin C boosts our immune systems, helping us to fight off ear-inflections, colds, and the flu. The minerals and vitamins provided to our bodies by pineapple give us supplies of anti-oxidants that boost our energy on the cellular level. Pineapple is a good source of dietary manganese, a trace mineral. Manganese in turn provides cells with the energy they need to fight off free radicals, helping to prevent the growths of some forms of cancer. Pineapple also supplies our bodies with thiamin, or vitamin B1. Thiamin also provides the cells with a boost of energy, helping them to regenerate more quickly. As we get older, our eyesight gets poorer. But did you know you can eat foods to help prevent macular degeneration? Studies have shown that adults who consume three or more servings of fruit per day reduce the risk of macular degeneration by up to 36% compared to adults who ate only 1.5 servings of fruit per day. Consuming pineapple in your breakfast, in salads, or as a snack can help you reach those important three servings of fruit a day, protecting your eyesight for years to come. Diabetes is an illness that results when the body cannot produce insulin, an important compound that regulates our levels of blood sugar. With the modern diet heavy in simple, processed sugars and unhealthy foods, diabetes has become more and more common. However, foods that are high in insoluble fiber are known to help prevent diabetes. Luckily, the 2 grams of fiber that are provided in every 1 cup of pineapple is insoluble fiber. If you are trying to prevent diabetes, including pineapple in your diet might be a good idea. A study done in Germany has shown a connection between bromelain, a compound found in pineapple, with wound healing. Although our bodies heal naturally, as we get older the healing process slows. Bromelain can give our body the boost that it needs to heal from wounds and injuries more quickly. 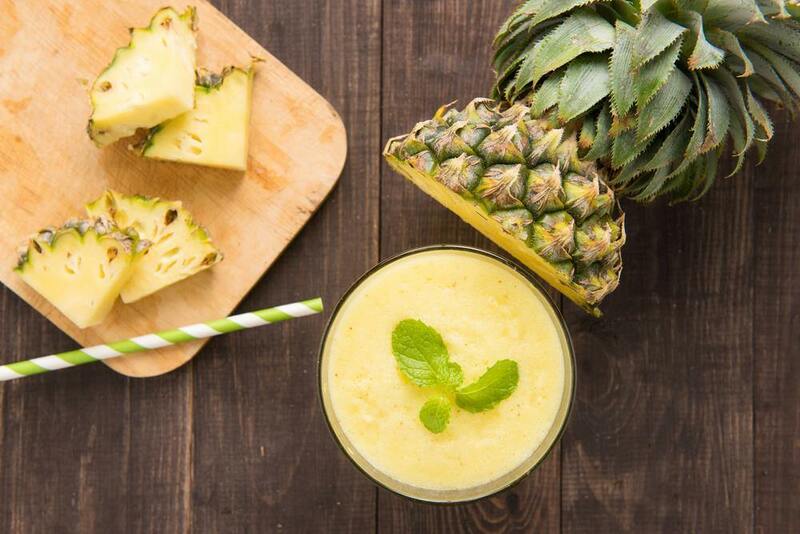 Drinking pineapple juice may be particularly effective in assisting with the healing process, so try sipping on a glass of this refreshing juice at breakfast. Everyone knows that the body needs calcium to build strong bones, but what many people don’t realize is that we also need manganese to maintain our bone strength. The body uses manganese to build and repair bones and connective tissues within the body. 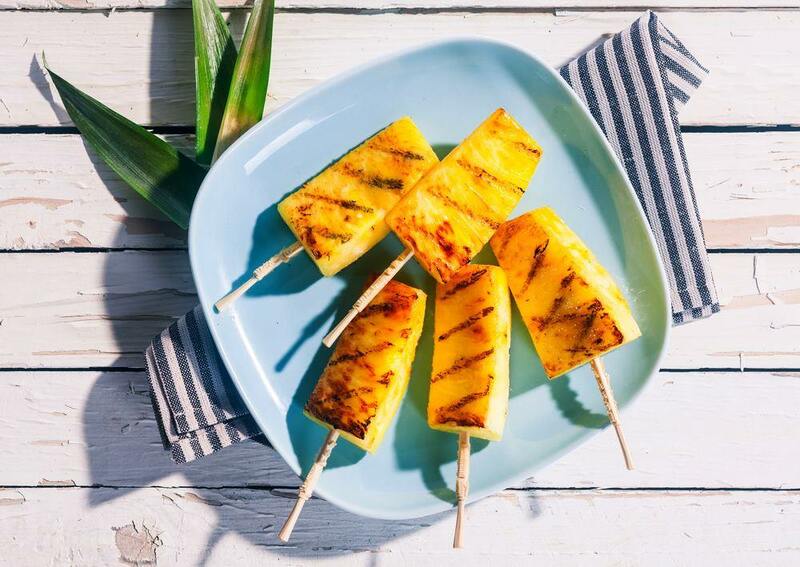 By eating pineapple, we give our bodies the tools it needs to maintain bone health. Manganese may be especially helpful in preventing osteoporosis in post-menopausal women. 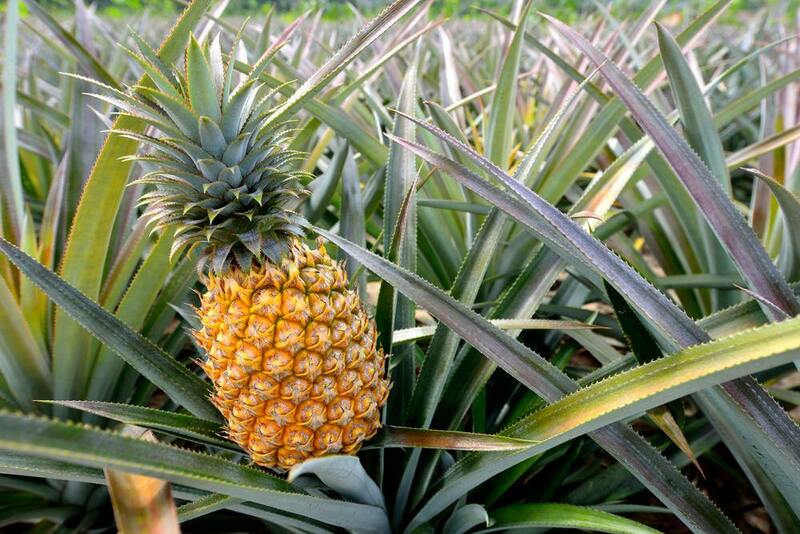 Eating one cup of pineapple will give you 70% of the recommended daily value of manganese! Pineapple is much more than a deliciously sweet tropical fruit. It is also a nutritional powerhouse that will benefit your body from your head to your toes. 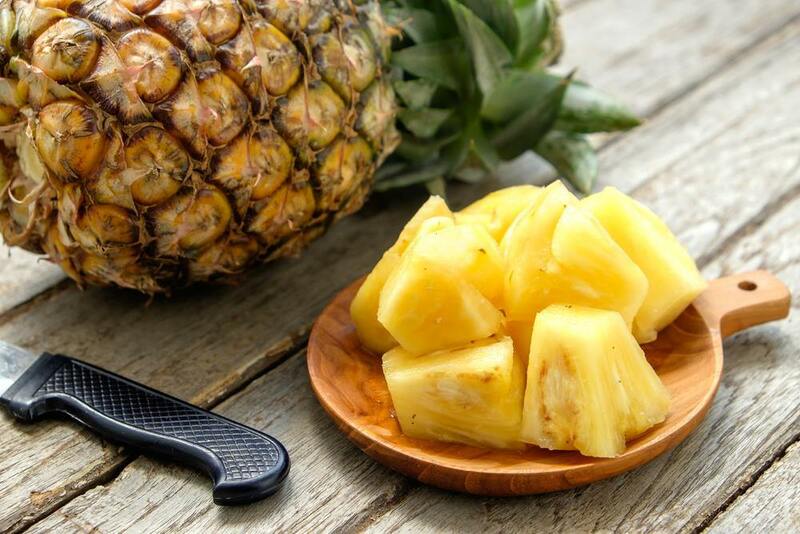 Whether you want to prevent diabetes, protect your bones, or increase your immunity, pineapple can help. 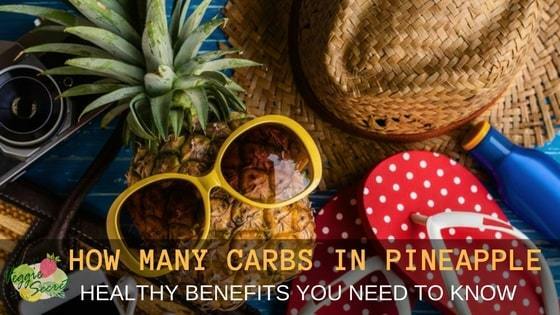 And now that you know how many carbs in pineapple there are, you have the knowledge you need to incorporate this delicious fruit into your healthy diet.